Welcome to Kids Day Giveaway! Today I'm giving away 4 pieces to 4 different winners! Kerry of LBH Creations is donating a custom dress of the winner's choice! Here is a sample of some of her work. You can visit the rest of her shop here. (She's all about some unique, vintage-y fabric and her attention to detail is the best.) If you win, you get to select the dress, fabric, color, size, etc. etc. etc. of your choice, and Kerry will create something beautiful just for you! I've written before about how 90% of children's music out there is horrendous. I mean, it will make your ears bleed. If you have/work with kids you know what I mean. The washed out British opera soprano singing Twinkle Little Star way up at the top of her register, the choir of 25 seven-year-olds shouting Baa Baa Black Sheep, and the 12-year-olds dancing and singing bad Ricky Martin covers. It's maddening. 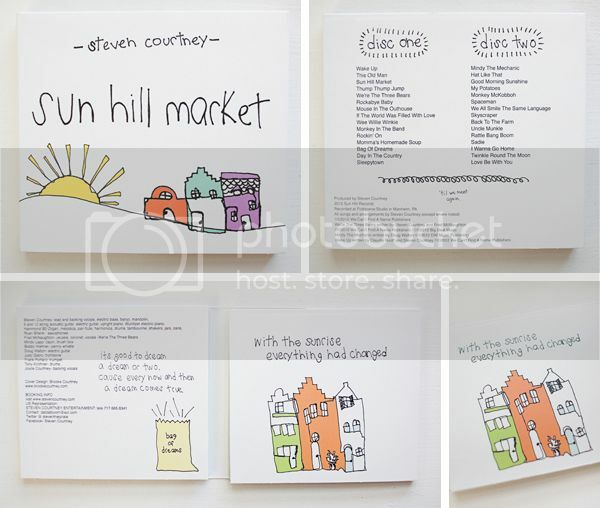 Sunhill Market, the newest album from Steven Courtney, is a breath of fresh air in the children's music department. It's family music - stroke of genius. Today I get to give away THREE copies of this sanity-saving music. 1. Just comment on this post! This serves as your entry to win any of the 4 prizes. (There will be four winners.) See? No flaming hoops to jump through. *To submit an extra entry for the LBH custom dress, pin your favorite item from Kerry's shop (here) to Pinterest and leave a separate comment saying that you did so. *To submit an extra entry for the Sunhill Market album(s), share your favorite Steven Courtney video on Facebook (you can find them here and on Youtube) and leave a separate comment saying that you did so. If you choose to submit extra entries for both items, you will have left a total of 3 comments on the post (which is the maximum). Be nice and spread the word, and come back tomorrow for the Design Day giveaway to win branding/graphic design services from Southtown Creative, a gift certificate for paper goods from Puddleduck Paper Co., and a gift certificate to the shop of home and graphic designer Shelby of the Honeysuckle blog!